When licensed cosmetologist turned publisher’s rep Kathy Patrick lost her job due to industry cutbacks, she wasn’t deterred. One year later, she opened Beauty and the Book, the world’s only combination beauty salon/bookstore. Soon after, she founded The Pulpwood Queens of East Texas — a reading group that dared to ask the question, “Does a book club have to be snobby to be serious?” The idea spread like wildfire. Now there are about 70 chapters nationwide. The overriding rule — aside from wearing the club’s official tiara, hot pink, and leopard print outfits — is that the groups must have fun. 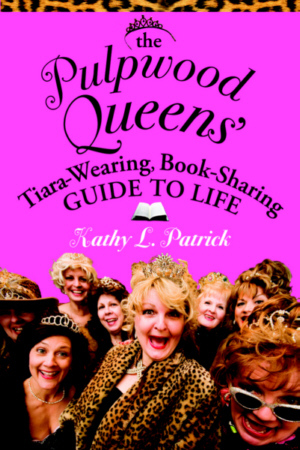 The club’s mission: To get America reading.THE PULPWOOD QUEENS’ TIARA-WEARING, BOOK- SHARING GUIDE TO LIFE celebrates female friendship, sisterhood, and the transformative power of reading. It includes life principles and motivational anecdotes, hilarious and heart-warming stories of friendships among the Queens, and stories from Kathy about the books that have inspired her throughout her life, complete with personalized suggested book lists.